It's not often that I buy a brand new Doctor Who book on the day that it's released. In fact it's not often that I buy any book on the day it's released. It's even rarer for me to read a book that I've just bought from beginning to end on the day that I bought it. But, needless to say, that is what I've done with 'The Angel's Kiss'. So I thought I give it a quick review. For those who aren't aware, 'The Angel's Kiss' is a Doctor Who novella that ties in the with most recent TV episode, 'The Angels Take Manhatten'. 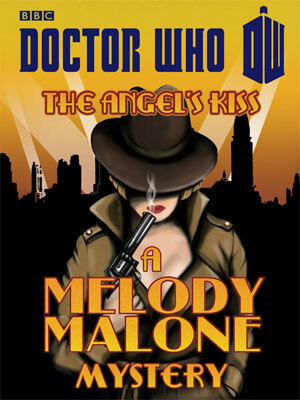 It's written in the style of a 1930s style pulp fiction novel and is supposedly written by Melody Malone aka River Song. 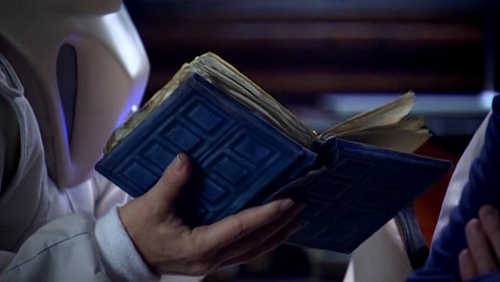 And, if the cover looks familiar, that's because it looks very similar to the book that the Doctor was reading in the episode and which ended up being rather crucial to the whole story. At this point I feel that I should point something out which I think certain fans may not be aware of. Whereas the book in the TV episode seemed to detail events of said episode, including an afterword written by Amy to the Doctor, this novella IS NOT that book. 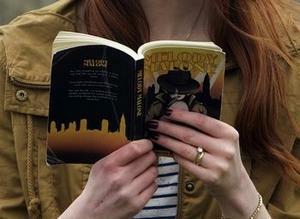 Rather, the novella acts as a prequel to the TV episode. A couple of characters from the episode briefly appear or are referred to but to all intents and purposes this can be read pretty much independently from the episode. In fact the link between the two stories only becomes really clear towards the end of the novella. The book itself is really good fun. It centres on Melody Malone helping a movie star who believes someone is trying to kill him. As I mentioned above it's supposedly written, in the first person by Melody Malone/River Song herself. The real author is regular 'Who' novelist Justin Richards who does a great job is capturing River's character. With one or two exceptions I could almost hear her voice in my head as I read it. It's actually nice to see River having adventures on her own for a change (neither the Doctor nor Amy and Rory appear in this) and one can certainly see the potential in the series of such novellas. In fact, given it's relatively brief length and it's pace, it almost felt like a 45 minute TV episode so if the BBC are ever looking for a new spin off series they could do worse than look at the adventures of Melody Malone. Much as I enjoyed this book I do have a couple of minor issues. The first is the fact that this has only been released as an ebook for the Kindle. To my (admittedly limited) knowledge it hasn't been released on any other e-reader device like the Kobo or Nook. Now while that's not an issue for me personally it does mean that people who don't have a Kindle or a Kindle app are going to have trouble getting hold of this which is a real shame. My other issue is with the climax of the story. As the book's only just come out, I don't want to spoil anyone so before you read any further you might want to go off and finish reading the book first because there is a spoiler ahead. I'll just wait for you. Finished? Good. Well my issue is basically with the Angel that appears at the end. Apparently the Angel seems to be able to somehow transform people into clones of other people (albeit ones with limited lifespans) and then somehow use the life force of those people to sustain itself. Now I've either misunderstood what I read or the Angel is displaying a power that has been seen or, to my knowledge, mentioned in the TV series before. Minor quibbles aside this really is a good, fun if undemanding read and, if you can get it, I'd certainly recommend downloading it. Hello! Does the rate of your posting depend on specific things or you write blog articles when you have an inspiration or spare time on that? Thanks in advance for your reply. Hello! In answer to your question I usually write when I have spare time but I try to do at least one post per week. If you look at the rest of you'll notice that I'm curretly working on a project that pretty much requires me to make one post a week. Sometimes it's difficult to find the time but I usually manage it. If I'm not working on a specific project then I'll usually write when I come up with idea for something to write about.